We've been getting a few questions about the max thickness the X-Carve can work with out of the box. This is a bit of a complicated question because it depends on the length of the bit you are using, the type of spindle you have, and the thickness of the material. The maximum thickness of material is about 67mm. The travel of Z is about 90mm. The longest bit you can install at this extreme is 38mm on the 24VDC spindle. You can cut on a piece that is up to 67mm, but you won't be able to cut through it without modifying the machine to increase the Z travel. If you know your material thickness you should be able use the numbers below to see if you are able to cut through it. One cool thing about X-Carve is it is an open source machine. We have published all the engineering files online. 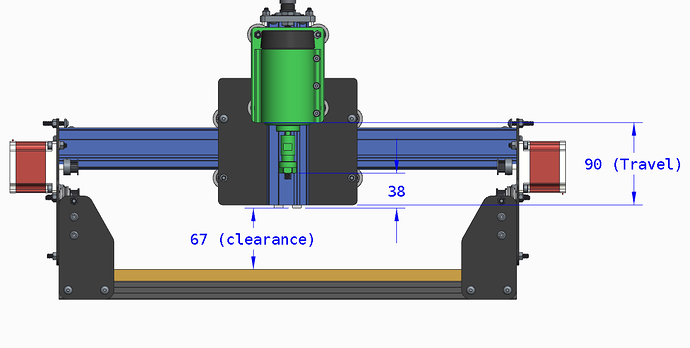 If you are interested in making modifications to your Z-Axis you can. You can bounce ideas off our awesome community in the community forum there are a number of people interested in making the Z longer. We sell MakerSlide and you'll need to figure out some other things like the clearance of the tool holder and the gantry. Some people have looked at solutions where you take out the waste board. If you have ideas post them to the forum we'd love to see them!